Cybercriminals are sending hoax invoice notifications purporting to be from the company to users. A link is included to view the bill online. Unsuspecting recipients who click on the link to view their invoice are led to what is currently showing as a blank page. However, MailGuard suspects the site could be used to serve a malicious file download. Eagle-eyed recipients will notice that real Xero invoices commonly use a PDF attachment rather than a link to an external website. Another easy way to check potentially-suspicious emails is to hover your mouse over the sender’s address. This will reveal more about the real sending domain. 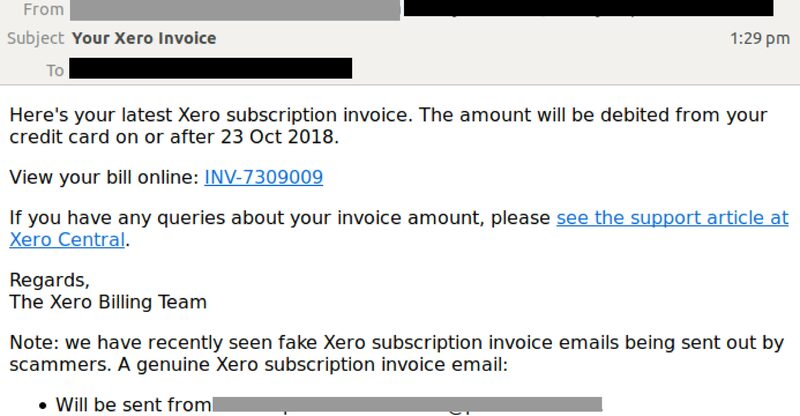 In this particular scam, cybercriminals have tried to make the email look as legitimate as possible by including the link to Xero Central’s ‘support article’ – a feature commonly included in authentic notifications from such a well-established cloud accounting company. In a similar vein, they have also added in a note at the end warning users about the increasing frequency of fake invoice emails purporting to be from Xero. Accountants, bookkeepers and financial professionals are particularly attractive to cybercriminals who know that they hold access to valuable financial information for company payrolls, invoicing, and the like. If your company is using an online platform like Xero, then you already know the benefits of cloud-based technology. Doing business online opens up opportunities for collaboration on an unprecedented level, but with that opportunity comes significant risk. Cybercriminals utilise sophisticated AI technology to monitor business and social networks and they exploit the data they collect to infiltrate organisations. All criminals need to break into your business is a cleverly worded email; if they can trick one person in your company into clicking on a malicious link they can gain access to your data.